The most obvious failure of policy is in those neighborhoods which are experiencing "displacement without development": decreases in both population and income. 12 of the cities in the study fit this profile. I'm going to be throwing a lot of data out there in this series, so I wanted to start with a few caveats about my process, and about data analysis in general. Accurately describing the social dynamics of the city through data analysis is a persistent challenge, and the geospatial dynamics aren't much easier to get at. 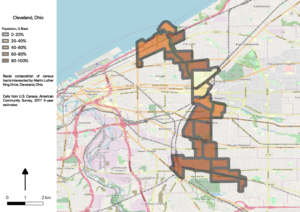 A simple-sounding question like, "how has the proportion of Blacks in this neighborhood changed over time?" runs into all kinds of problems with the definition of terms and the availability of data. 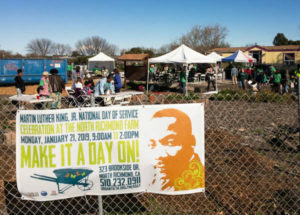 As I've ridden around doing field work, I've noticed that many cities have a Way, or a Boulevard, or a Drive, or a Parkway, named for Martin Luther King, and that those streets are often located in neighborhoods which were predominantly African-American in the 70s and 80s when the dedications were made. Like gentrification itself, the answer is complex. I generated a lot of rich data to analyze, so this post will be the first of several digging into it. But here's a teaser. 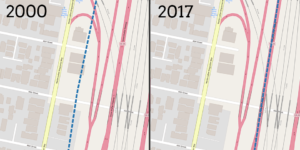 Here are some maps I'm working on, trying to combine OPD police stop data for bikes and pedestrians with demographic info. It's not good. 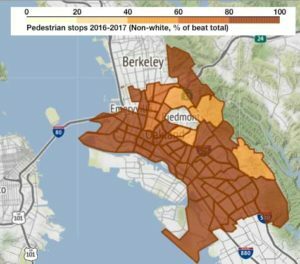 In every police beat in Oakland, the majority of pedestrian police stops are of non-whites; in most beats, it's above 80%. Bike stops are not much better. 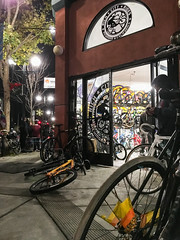 I was invited to speak at LuckyDuck Bike Cafe's "BikeStory: Advocacy" event this past week. There were a total of six speakers. mostly from the traditional bike advocacy world, and a sizable and pretty appreciative crowd. In my preparations for the talk I made some progress on boiling down the concepts of the Bike Lab's work. 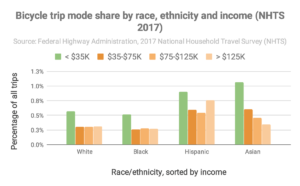 The 2017 National Household Travel Survey is out! 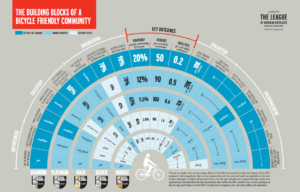 In preparation for my talk next week at Luckyduck Bicycle Cafe, I dug into the data to see if the findings from 2009 hold, and they mostly do. 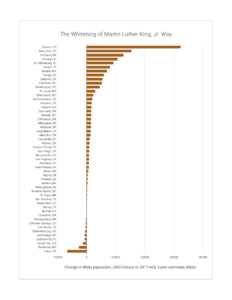 Hispanics have the highest cycling mode share overall, and the data suggest substantial differences in cultural relationships to active transportation modes. 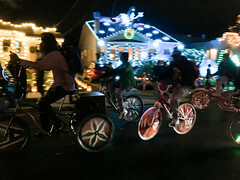 I got to do two holiday rides this year, with Rich City Rides and the Scraper Bike Team, and it got me thinking about what it means to celebrate the holidays in that way. Holiday traditions are important to communities, and that both of these community groups have incorporated the bicycle into their own traditions speaks to the way the bicycle has become part of their identities. That will have long-term effects on cycling rates, and therefore health and wellness in those communities. And these kinds of rides can help brake down the barriers which separate East Oakland from Alameda. 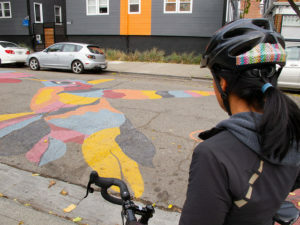 I led another bike ride for Walk Oakland Bike Oakland (WOBO), the lead sponsor of the Paint the Town program, which gives groups the opportunity to collaborate on painting an intersection or street. 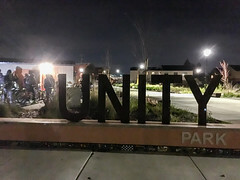 The city waives permit fees and provides a small bit of funding, and the neighbors work together to come up with a design and do the project. It's a pretty cool program, inspired by City Repair in Portland. 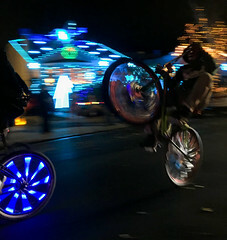 I'd done a ride to visit a number of Portland's projects, and doing a similar ride in Oakland seemed like a fine idea. 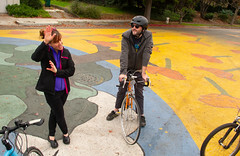 My feed today lit up with friends sharing the news that Oakland has been granted Gold status in the League of American Bicyclists' "Bicycle Friendly Community" program, which has been a goal of the advocacy movement here for some time. As you might expect, I have an opinion about it.